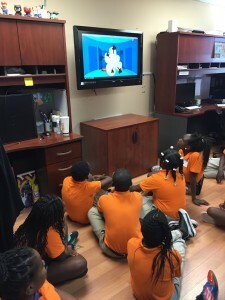 In May 2015, Science4Us hosted 40 elementary school students from a Title 1 (100% of the kids at this school are free or reduced lunch) in their office to talk to them about careers. Careers for forty kids who basically live in a part of town where it’s pretty chaotic and planning for careers, for these kids, isn’t a dinner time converstation with the family. In most cases, there isn’t really a sit down dinner time or orderly conversation. Never mind much discussion about careers. It look a lot of scheduling and logistics. Think about it. Forty kids leave school on a school bus with principal and full staff. Arrive at an office. Get split into five groups of 8 each with two guides: one from their school, one from the staff of the office that they are visiting. Tney are moved among five different centers each of which has them for 20 minutes. There are snack and toilet breaks. Each center has a fullly appropriate set of activities and agenda to expose the kids to career ideas. Is this sort of big effort worth it? Did anything change for these kids? Did anything change for any of those kids? Did it affect the adults in a positive meaningful way? Did it affect the adults in a positive meaningful way? The answer here is definitely yes. It shows the company that they can make an effort to reach out and share some vision of the possibilities to kids to whom it makes an impression. Did anything change for these kids? Did anything change for any of those kids? Here the answer is yes and no. The event successfully “met the kids where they are at.” It spoke to their level of understanding and knowledge and was intended to give them some specific examples of what they can aspire to. For those who are artsy, it showed specific reasonable careers that they can get to. It highlighted that there are lots of support job but that writing and verbal skills really matter. For the technical ones, it made coding look a lot clearer.